The 19-year-old held his arms aloft after scoring Juve's second in the 2-0 win, seemingly in response to chants, and was subjected to further abuse. Italy international Bonucci - who scored the opening goal - told Sky Sport Italia: "You celebrate goals with your team-mates. He could have done it differently. However, in his post-match interview Allegri called the fans directing abuse at Kean "idiots who do stupid things and ruin it for everyone else" and said the authorities "don't really want to" tackle the problem. 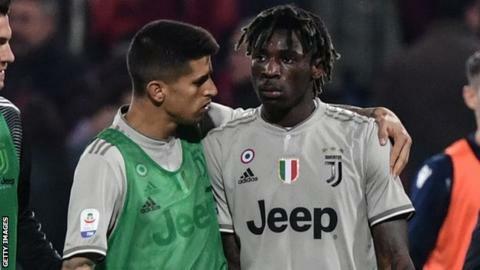 Kean's Juventus team-mate Blaise Matuidi protested to the referee after the abuse and threatened to walk off. The France midfielder later posted a photograph of himself and Kean, who has Ivorian parents, on Instagram with the caption: "BIANCO + NERI (white and black) #NoToRacism." After Kean scored in the 85th minute, play was stopped for about three minutes and a warning was broadcast to the crowd - the first step in the three-step procedure which ultimately leads to the teams being led off the field. The home side's president, Tommaso Giulini, blamed Kean, who has scored two goals in three games for Italy, for his celebration. Earlier on Tuesday, Uefa president Aleksander Ceferin asked referees to be "brave" and stop matches if there was abuse from "loud, aggressive and primitive" people. Sterling, who celebrated by putting his hands to his ears in a gesture, later called on football's authorities to take "a proper stance" and crack down on the racist abuse. "It was one of those where it was to let them know, you are going to need to tell me more than that we are black and what we resemble to affect us," added Sterling.